Investors have been worried for years about how Apple (NASDAQ:AAPL) will continue to grow their business. 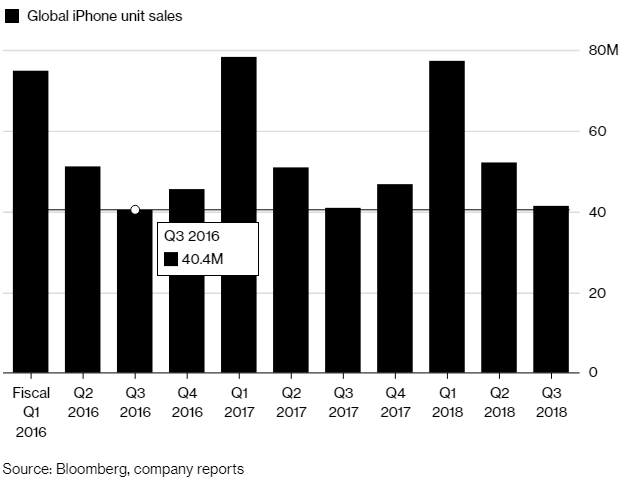 iPhones have long reached market saturation and as we talked about in our coverage of Apple’s quarterly statement, unit prices are basically maxed out for iPhone models. The answer is shaping up to be Apple’s rapidly growing “Services” unit. In 2016 Apple booked roughly $24 billion dollars in service revenue. This is primarily a mix of Apple Music, Apple Pay, iCloud, Apple Care and the App store. This fiscal year, through three quarters, the Cuppertino-based company has booked over $27 billion, putting it on track to record an all-time annual high of $36 billion dollars. Apple Service revenue to exceed $48 billion by 2020. With iPhone unit volumes and iPhone ASP’s (average selling prices) maxed out, this is exactly where the firm wants to be headed. CEO Tim Cook has gone on record saying he wants his company to achieve double that of 2016’s service segment revenue, $24 billion x 2 by 2020. It’s important to keep in mind that marginal profit on services like Apple Music and the App Store are much, much higher than physical products like iPhones and Macs. Once infrastructure and software are written, much of these sales are extremely low cost. Contrast that with iPhones where every device requires a minimum of raw materials, manufacturing, packaging, and shipments across the globe. Perhaps Mr. Cook taking a page out of Jeff Bezos book. Amazon(NASDAQ:AAPL) succeeded rolling out a subscription model by packaging together things like 2-day shipments, Amazon music and video streaming into the wildly popular Amazon Prime membership that now costs subscribers $129/year. Apple could eventually package a form of Apple Care, Apple Music, and free App Store downloads into a similar model.